If one assumes, as one should, that the Iranian leadership is determined to build a nuclear arsenal and the means to deliver it, then the economic issues (sanctions, boycotts, embargoes) that drive the P5+1 negotiations are tangential. They affect the speed, cost, and difficulty of building an arsenal, but do not impede its ultimate realization. The only way to stop Iran's program is by using force, presumably by attacking its nuclear infrastructure from the air. Yet this prospect, now marginalized as the "war option" in contrast with two years ago, is no longer discussed. With Binyamin Netanyahu just reelected prime minister, Israel has a leader seemingly prepared to take fateful steps. Distracted by negotiations, however, we hardly think about this – even though the Israel Defense Forces has twice before attacked nuclear installations (Iraq's in 1981, Syria's in 2007), and both times to universal surprise. 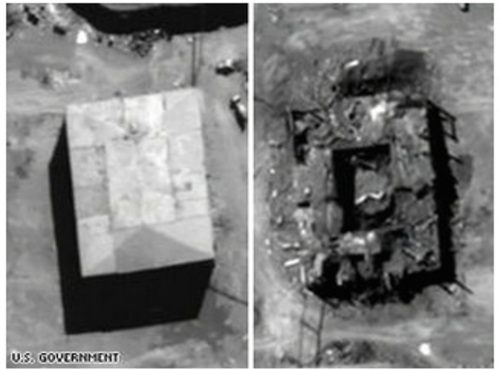 Before and after the Israeli Air Force attacked the Syrian nuclear reactor at Deir al-Zour in September 2007.